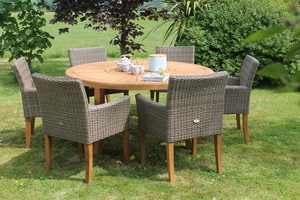 Gradis hardwood, round table with 6 aluminium/rattan chairs dressed with 6 cushions and lazy susan. 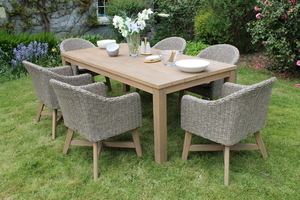 The Corrib six seater dining set is ideal for any outdoor dining occasion. 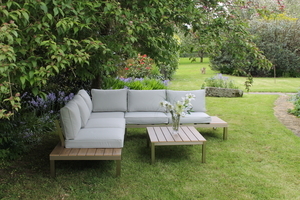 The round table is a very sociable design and any extra guests can be accommodated around it! The chairs contemporary in design and very comfortable. The lazy Susan is not only attractive it is also very practical when sharing food and drink with friends and family. The hardwood dining table and rattan dining chairs make light work of any maintenance!